As part of the annual St Patrick’s Day celebrations yesterday, our 2015 Student Leaders were officially commissioned. The commissioning ceremony took place during the formal school assembly prior to the day’s liturgical celebration. College Captains, Sam Foster and Courtney Edgecombe along with six Trade Leaders, were introduced to special guest, City of Playford Mayor, Glenn Docherty, and St Patrick’s Technical College Chair, Mrs Tricia Hicks. Each was presented with their badge and a certificate indicating their appointment. The leaders each assisted Fr Pat Woods during the St Patrick’s Day liturgy which was followed by the annual Project Compassion Carnival and Irish Games. The Irish Games were won by the School of Engineering & Transport who capped off their performance by taking out the tug-o-war main event. Other events included tunnel ball, the three-legged race and the potato and spoon race. This entry was posted in Community Blog, Latest News on 18/03/2015 by St Patrick's Technical College. 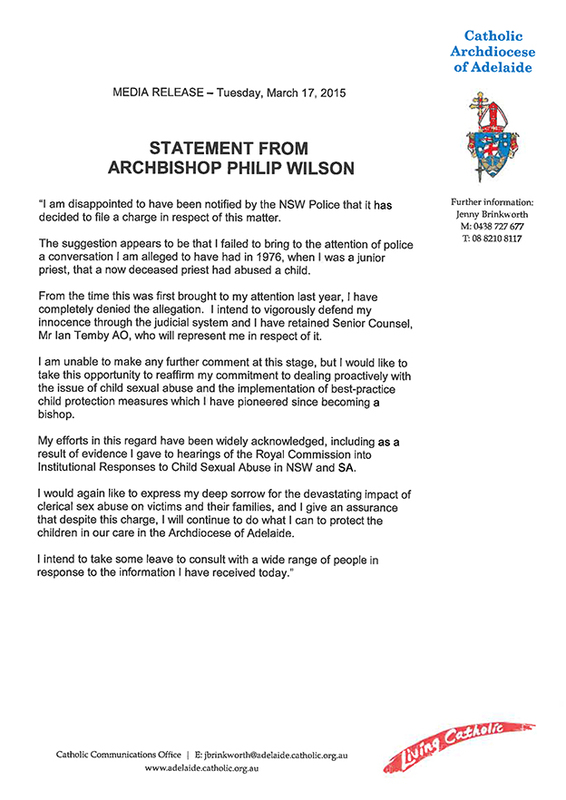 Acting Director of Catholic Education SA, Helen O’Brien, has asked that the following statement from Archbishop Philip Wilson be made available to all members of our College community. This entry was posted in Latest News on 17/03/2015 by St Patrick's Technical College.